Since today is Festivus, I'm celebrating it with an airing of a grievance. There are so many things about the holiday season that should upset me that don't. Long lines, bad traffic, deflated snowmen and reindeer on my neighbor's yard. First, Jesus is a redhead, which I'm fairly certain is not ethnically accurate. Second, SANTA IS NOT REAL. You can even put baby Jesus in a toddler bed with a a down pillow and a homemade quilt and SANTA WOULD STILL NOT BE REAL. Are these figurines an attempt to make Christians feel better about combining the birth of Christ with elves on the shelf and reindeer on the roof? You have permission to not feel guilty. 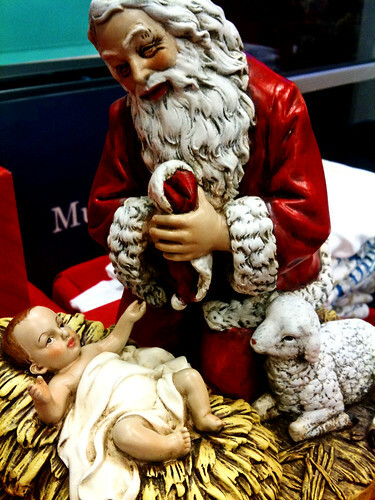 Celebrate Christmas in all those ways - both secular and religious. But don't try and merge them into one tchochke. So what are your grievances about the holidays? What chaps your reindeer hide? Black Santas. Some would say Santa could have been black. I would say St. Patrick could have been a Filipino. 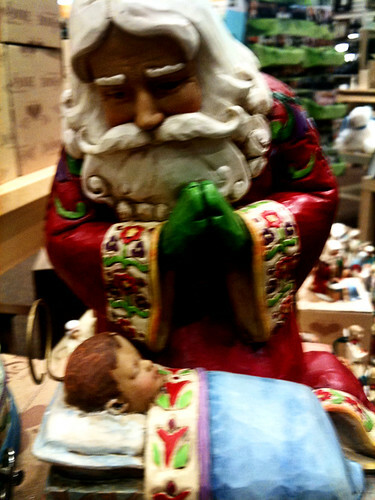 Santa is white people. Make sure and note I hate seeing all of the White American Jesus pictures at church. Jesus looked more like Osama Bin Laden than he looked like me. I like to look at it as it's Santa acknowledgement of the celebration of Christ's birth as the REAL meaning of Christmas. AMEN! I just saw a big inflatable lawn ornament like this last night and about gagged. Nice to know we share the same pet peeves...I think. Jesus looked Jewish, so that means he must have looked like Max Weinberg. I hate blow-ups in the yard for one reason: daytime. When you drive by a house that has a bunch of blow-ups in the yard during the day, it looks like a massacre hit. Dead rip-stop bodies everywhere.